Posted on Tue, Jul 21, 2009 : 12:31 p.m. Always carry a bag. Of course newspaper bags will soon be a relic, that is what I've carried for the last few decades. Even before I had a dog. But there are still produce bags, brown paper bags, and of course reusable bags. I try to always have a couple in my car, my truck, my bike, my backpack, and in my pocket if I'm traveling light. You never know what you may encounter, even if it is a simple trip downtown. Do you need to get fancier than that? Well, tools do help. My latest tool is a container I use for picking. It is especially great for berry picking. I can now use both hands. This container is cheap and easy. 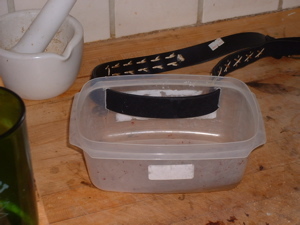 I took a plastic storage container missing its lid, and an old belt. I drilled two holes as far apart as the width of the belt, and then cut a list between them. I did that on each end, then slid the belt into the slits. 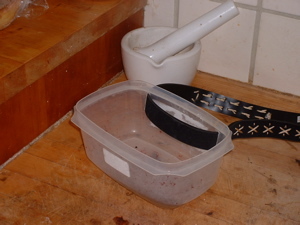 To be practical, it should hold at least a quart of berries or other plant parts. Harvest time, I wear the container in front, and have a hands-free holder for whatever I'm picking. I empty it into another container once it is about half full. Otherwise, when I bend over I can lose those precious berries or other contents! A pocket knife is also a great tool to always have with you. The problem is that so many places don't allow them - airports, schools, and the county building here in town. So you have to plan ahead and sometimes leave it behind. You can dig shallow roots and tubers with a stick, otherwise a shovel (for roots like burdock), a small weeding fork, or a variety of small implements are handy to choose from depending on what you plan to harvest. I don't use gloves much, but many people prefer them. Especially with stinging nettles. I actually enjoy picking those barehanded. A tall step ladder can come in handy for fruit trees. I'm not much a tree climber, and I'm also only 5'5". I'm working on a tool that I can use to pull branches towards me, but I haven't made it yet. I'll post a photo once I have, it should be before the first pears and apricots ripen. You can certainly improvise with what you have laying around. The belted berry picking container is the most elaborate I've ever had, but it sure is coming in handy. The real point is that you don't need special tools. But get used to the idea that with any trip outside you might find food that you'll want to eat on the spot or bring home to prepare. So have that bag handy.